Dirty Laundry | The Worrywart's Guide . . . . I know there is a very small percentage of the population who will not understand this post (they are the same people who leave symmetric geometric patterns in the carpet when they vacuum), however, most of us are random vacuumers and struggle with the topic of this post: laundry. When the kids were young, I would start out with a huge pile of clothes to fold on the sofa while they were watching Barney. By the time Oprah rolled around at 4:00 in the afternoon, I had barely made a dent in the pile (even Barney was more interesting than folding clothes). Piles of laundry may be the reason I went to graduate school and ended up with a masters degree in Ed. Tech. I wanted to be a stay-at-home mom, but every day could not be a trip to the zoo and I had a very hard time reconciling my desire to be a wonderful mother and to be involved with something more interesting than folding laundry while a purple dinosaur professed his love for me. Is Barney still around? Ironically, it was not until I returned to work full-time (several years later) that I finally slayed the laundry beast once and for all. The system is very simple: 1) everyone in the family has their own stylish Martha Stewart laundry basket (purchased from K-Mart, the only “department” store in Tahoe and a great place to buy “sizing machines“), and 2) no one can start a new load of laundry until the clothes in the dryer are folded and placed in the correct baskets. 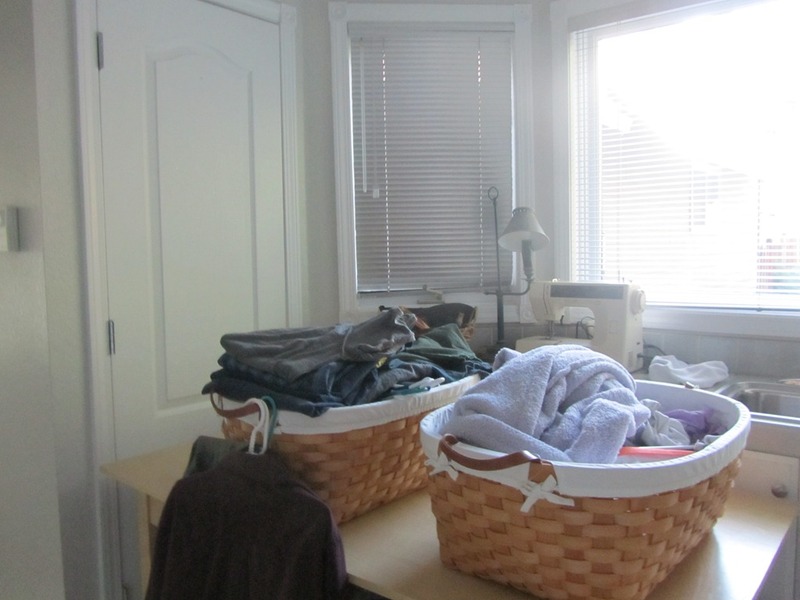 This system has worked for years – no piles of laundry to fold and the laundry is always done. Why am I writing about this today? One by one, the kids have taken their stylish Martha Stewart baskets off to college with them (little do they know that other people have dressers and closets). Ralphie packed his today – we are down to two baskets. BTW: The only flaw in this system is socks – there are three baskets of socks under the table (I have an MA not Ph.D! ).